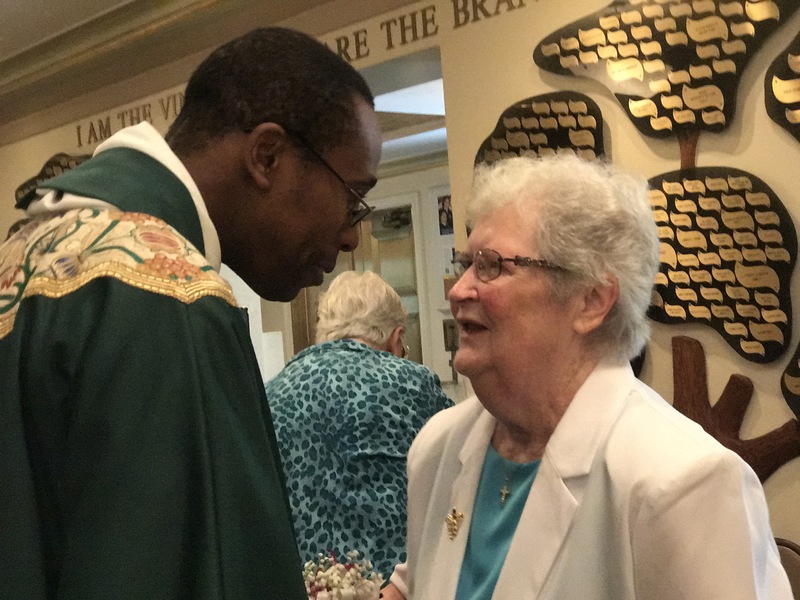 Father Rodnev Lapommeray, parochial vicar at St. Sebastian parish, speaks with Sister Theresa Ryan, S.C., the last of the Sisters of Charity of Halifax to retire from St. Sebastian’s Academy. Sister Theresa Ryan, S.C., gave herself freely for 45 years for the benefit of the students and parishioners at St. Sebastian. As the parish honored her during Mass Sunday, June 25, the last of the nuns at the Woodside academy asked for a parting gift. “Pray for me as I continue to be what I am, a Sister of Charity of Halifax,” she said when she was invited to speak at the end of Mass. She explained that although she would be retiring from her teaching career, she would not be retiring from her vocation and would strive to continue to be a joyful witness of Christ on Earth. She thanked the members of the congregation, which included generations of students, for helping her along the way. “I am a better person because of the lives that have touched me,” she said. Msgr. Michael Hardiman, former pastor, returned to the parish and preached the homily at the invitation of current pastor, Father Kevin Abels. “I thank you for the contributions you have made to my life during my time here,” Msgr. Hardiman said. “We celebrate you, but it’s your relationship with God that has enhanced us all. Sharon Gillespie, a teacher at the academy, said Sister Theresa has left such a strong Catholic imprint on the school, it would be difficult not to follow in her example. “You know the image of the Angel and the Devil on your shoulder? Well, she was my angel,” said Mary Cotter O’Brien, a fellow teacher. Cotter O’Brien said Sister Theresa has helped her keep her cool in many a situation and saw the best in everyone she met. She was also fun to be around. A jokester is how Gillespie described Sister Theresa brought levity to a demanding job. “She called me number 13,” said the current principal, JoAnn Dolan, with a wide grin on her face as she recalled that fact. Thirteen is how many principals at St. Sebastian the sister has worked under. “She remembers everyone by name,” Gillespie said, whose father and stepmother were students of Sister Theresa. There were 40 kids to a class back when Diane McKenna-Linechan, Gillespie’s stepmother, was in Sister Theresa’s class. She recalls that the nun tried to make sure every student understood what she was saying and took care not to speak above the students’ heads. She also remembers Sister Theresa having high expectations of her students and being quick to correct her students when she needed to. Wally Bishop, who had her as a sixth grade teacher in the late 1960s, said she was his favorite teacher. He admired her “her overall holiness and compassion and understanding of kids who struggled,” he added. Jennifer Penitez Amare remembered Sister Theresa pushing her toward more than she expected of herself. This gave Penitez Amare a strong sense of confidence and planted a desire to follow in her footsteps. She became an ESL teacher in the public school system. Penitez Amare’s daughter, Ciara Amare, also joined the ranks of Sister Theresa’s students a couple of years ago in Pre-K. Sister Theresa came to spend time with the younger grades and pray and sing with them. Penitez Amare was overjoyed that her daughter could also benefit from Sister Theresa’s goodness and light. Sister Theresa professed her vows 60 years ago. Her family moved to St. Sebastian’s when she was still in high school, exposing her to the lifestyle of the Sisters of Halifax. Just three months after graduation, she moved in with the sisters to become a novice. Throughout her teaching career, she has relied on prayer to guide her. She said she asks for patience and guidance when dealing with children so that she might be the face of Jesus to those who may be struggling. She also said that she is confident that the faculty and staff at St. Sebastian’s will continue the works of the Sisters of Charity thanks to St. Elizabeth Anne Seton.